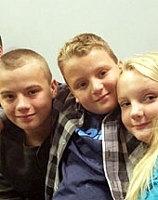 Josh is the oldest of these three close and loving siblings. Josh enjoys playing basketball, playing video games, swimming, hiking, and going on outings. He has participated in Club Empowerment, weekly horseback riding, campus work program, and learning independent living skills. Josh has continued to make improvements; he has shown maturity, willingness, and ability to follow routines and rules. Josh has the potential to succeed in a leadership opportunity. He continues to maintain positive relationships and communication with his peers. Rijena is the middle sibling and she loves animals, doing crossword puzzles, listening to different music, doing arts and crafts, and outdoor activities. She has done a lot of volunteering at Copper Crest farms where she worked with the horses and she really enjoys horseback riding. Rijena is also very smart and does very well in school. She is a sweet and loving little girl. Jacob is the youngest of the three siblings. He really enjoys going on recreational outings to local festivals, fishing in ponds and lakes, and hiking trails. Jacob has participated in Club Empowerment, chapel services, and volunteered at Copper Crest Farms. He also really likes drawing, swimming, horseback riding, and riding bikes. Jacob is also interested in music and has expressed an interest in learning to play the piano. Jacob is very respectful and continues to improve on his primary goals.